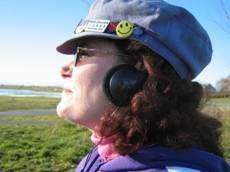 Aiyana Markling and I met for the first time last summer at an Ocean Shores Kite Festival. Aiyana had been flying kites for about a year and a half. (Incase you had not noticed kite flying, especially competition flyers, are mostly men.) Meeting Aiyana was a real treat-another female kite fanatic in the sport! Then along came www.Kitelife.com’s forum which is a great forum for flyers to share their interest in all aspects of the sport. This forum led to Aiyana and me becoming friends and her extending an invitation to come check out the kite flying in Canada . 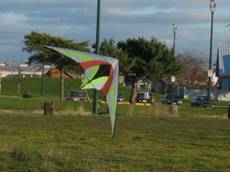 It was perfect timing because the Vancouver Kite club was holding an indoor fly on Sunday, as well as their annual Christmas Dinner on Sunday evening. Aiyana jumped in her car and drove to my rescue, her long curly red hair flying with wild reindeer antlers blinking madly away on top of her head. There certainly was no overlooking her in a crowd! That evening we stayed up late and visited, sharing our interest in kites, getting to know a little more about each other, etc. The next morning we had a delicious breakfast compliments of Chef Aiyana, and then we headed to the fly field! Garry Point Park is adjacent to the Fraser River mouth and over looks the Gulf of Georgia . The scenery surrounding the field was refreshing although foreign to me. I had never flown kites while they dredged up a river for a mammoth cargo ship to pass what appeared to be only a few 100 feet away. Some of the ships are soooo big that they literally block the wind for a few moments.it makes for some interesting flying! 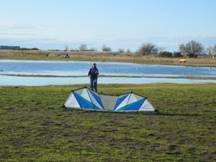 With the previous rains the normally large field had developed a huge pond where a dozen ducks swam happily oblivious to the many park goers and a few colorful kites. There was plenty of room to fly though, so we put up a couple of revs, 1.5 standards and a Rev I SUL, and started playing in the light winds. Then who should come along, but an old friend, Cal Yuen and his bag of kites. Cal has been my hero on several occasions, getting graphite splinters out of my fingers, helping with costumes, on the field, etc. It was a nice opportunity to hug him on his own turf. Next I met Tony Tung who joined us with his homemade Rev. kite. Soon we had everything flying up in the air from Cal ‘s Pizzazz (?) to my Rev. Super Blast. We picked up and tested each others kites to enjoy and assess how they flew. It was marvelous, a beautiful blue sky and a lazy afternoon playing musical kites. The winds had lightened and the day was wearing on, so Aiyana and I left the field to do some shopping. (We are females after all.) I had not stopped to exchange money so imagine my surprise when I gave the clerk a $20 to pay for two espressos, and in return received a $20 bill and some change. It was a Canadian $20, but still it took me by surprise. Saturday evening we visited, talked kites, watched kite videos, and chatted about kite flyers, festivals and even perspective festival spots. You know like kite memories, dreams, and other such things. What bonding! And the anticipation was building for the following day! We awoke early and again Aiyana came up with a mouthwatering meal; Nested Eggs on toast with special spices! Yummy! Then off we went to the Maple Ridge Community Center for the indoor kite fly! Oh boy! 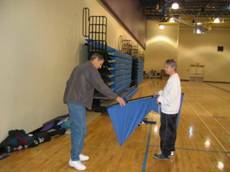 The club had access to a large gym in the community center with music piped in. Perfect! Harry Jung was present, and I met his wife Kathy. There was Ray Underwood with his son Tristan. I’ll tell you what, 7 yr. Old Tristan is a very new indoor flyer, but he was working it! He was a remarkable “pick-it-up and keep it going, extremely focused indoor flyer.” This young man impressed the heck out of me! He already has three songs chosen for different competitions this season, so consider your self forewarned. Egan Davis was another young man, (29…that’s young to Me. ) he is a new- but progressive indoor flyer. I thought while watching him, he doesn’t just fly-he studies how to do it. This is a good thing. I showed them my one handed revolution handles with the indoor rev. Those that tried it were pretty impressed. Several plans to build a few pair were discussed. And I’ve since passed on Rodger Maddy’s plans to Aiyana to share with those that are interested. All too soon the indoor fly session was over, and it was time to head out. On the way back Aiyana took me on a sight seeing tour of the area, even pointing out a spot where I could hop back and forth from the Canadian border to the USA border. We enjoyed the architecture we saw that was so different then my home just a few hours away. Then back to the house to get ready for the BCKA’s (BC Kitefliers Association) annual Christmas Dinner. Aiyana is also a Mary Kay Cosmetics Representative, so we played in the makeup and cleaned up fairly well for kiteflyers. Hehe We put on dresses and heels and headed to the restaurant, where we found ourselves lost in a small city of restaurants. Seriously, I have never seen so many restaurants! Finally we found ours, a cozy Greek Restaurant that neither of us can remember the name of, but the club had made a great choice. I’d never had Greek food other than a gyro sandwich. It was terrific. A few of the lady’s had said they came just for the dessert. They were right. We had coconut custard on a wafer w/sauce. Diet? What diet? It was a wonderful first experience for me. 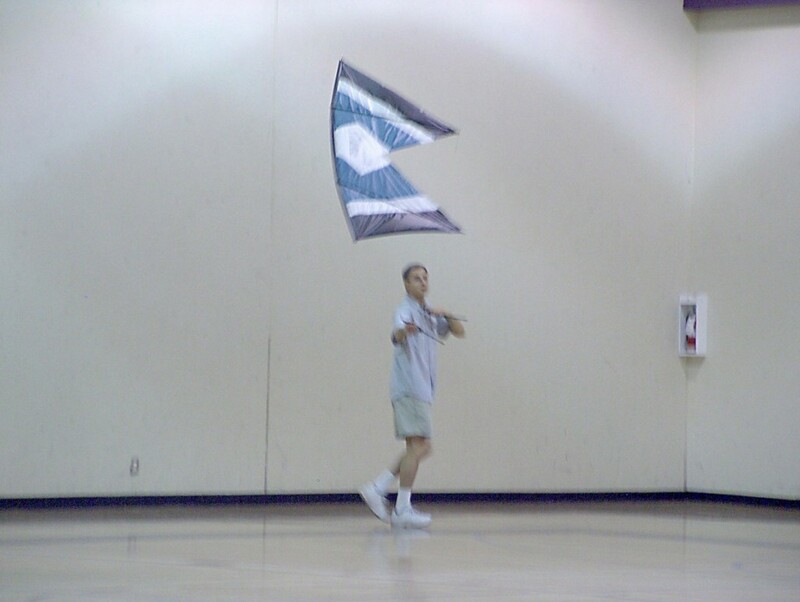 Most of the indoor kite flyers were there, and there was certainly a good turn out from the rest of the BCKA members. I even got to see a few flyers I hadn’t seen in some years. It’s funny how people can touch your life and you know you will see them again. The camaraderie was wonderful, and as an outsider I was made to feel very welcome. The highlight of the evening was not the door prizes we won, or even the perfect dinner. The highlight of the evening was when a new couple sat down across the dinner table from Aiyana and me. Newbies!! They had purchased an Adrenaline kite and knew little about kites. We were in heaven. KAP, ballets, Roc’s, fighters, kitemaking, we tried not to leave any information out. That poor couple probably left with headaches from to much information. They were very nice and we look forward to seeing them again. Exhausted we returned home, where I found one earring (which I had glued earlier) still on the kitchen table. Hmm, one earring in my ear and one on the table. Some things never change. My friends have always said you can dress me up, but you can’t take me anywhere! The next morning it was time to head back to the states, hugs good-by, promises for return visits, and I was on the road home. What a wonderful weekend it was. You know there’s nothing like kite flying unless it’s meeting the wonderful people that share your interest and their lives with you. Wow! Nice job Penny!! I don’t really know what I can add to your delightful recounting! I do remember our meeting that day in Ocean Shores . I had heard about this Penny, everyone seemed to know her and spoke so very highly of her so I just knew I had to meet her. I asked some of my friends if they could point her out, sucked up my courage and went over and introduced myself. She was so nice and so gracious, we hit it off instantly and like she said, in a male dominated sport, finding another female and a kindred spirit at that was such a treat! Through kitelife we kept in touch and our friendship grew. The year rolled on and soon plans were underway for our annual Christmas Party. Our club has a few members who started to fly indoors and I thought how nice it would be if I could get Penny to come up for a visit and fly. I asked several of our members if they would be interested in coming out to an indoor fly and that I was hoping Penny would come up to join us. So I emailed her with an invitation to come visit and to be my guest at our annual Christmas Dinner. To my utter delight she said she would come up. The night Penny came up was horrible! It was raining and windy and frankly I was surprised that she even came in such awful weather. Specially since her friends down South had warned her about the wild ” snowsnakes ” that were rumored to inhabit our fair land. I assured her that while we did indeed have snowsnakes , that they were well trained and would stay up in the mountains where they belonged. So inclement was the weather that Penny missed the turn off to my place and ended up quite lost. She phoned and told me where she was and I set off to find her. I donned my “flashing” antlers..hey..it was December, Christmas was coming and I wanted to celebrate the fact that Scientists have now proven that all of Santa’s Reindeer were girls!! And I wanted to put a smile on Penny’s face, considering the abysmal weather she had driven up in I thought a smile would help! We got safely back to my place and found that Rum was also a “common” interest! ~giggle~ We talked long into the night, really getting to know one another. I won’t say how much Rum we drank.there are some things a gal just doesn’t tell!! Next morning we were up early, breakfasted and on our way to Garry Point Park, the local kiters hangout. It was a wonderful day, bright and clear and we got to play musical kites with some of the OPK’s that were set up. Penny was inadvertently introduced to a local phenomenon called “instant loss of wind” when a huge cargo ship headed up River and stole all our wind for a short time! As the winds died and the day wound down, Penny and I left for my place again, stopping along the way to shop..like DUH! What did you expect two women to do??? Eventually we got home had supper and talked, watched videos and relaxed in preparation for tomorrows adventures indoor flying. The indoor fly was a huge success, and our gang was thrilled that Penny had come up! Most of us are relatively new to indoor flying so having Penny there was a huge plus. She did one of her indoor routines, showed us one-handed flying and allowed most of us to try her one-handed handles. quite different from what I’m used to but I could see the potential and bugged her to email me the plans for the handles. A couple of the other club members overheard me asking her for the plans and they chimed in saying they’d like the plans as well. True to her word she emailed me the plans..now all I have to do (looks around guiltily) is pass them along as I promised! Our indoor fly came to and end and we headed back to my place to get ready for the Christmas Party. And yes, we cleaned up pretty good for Kitefliers!! It took us a few minutes to find the Restaurant but we finally did and joined the rest of the BCKA members in a delightful evening of eating, talking with new and old friends, Penny even won one of the door prizes! (Now she has to come back again to use it.it was a gift certificate to another local Restaurant.) The evening came to a close and we headed back to my place for a final evening of relaxing and talking. Monday morning came all too soon and Penny was on her way back home amid hugs and promises of more visits to come. It seems that time goes by so quickly when you have a passion for kites and the people who fly them! I’ve been so blessed by the people I’ve met through kiting. Kite people really ARE the nicest people. . This entry was posted in 2004, Events / Festivals, General Topics, Indoor Kiting, Issue 34 (Jan/Feb), KL Archive, Reports and tagged bcka, indoor.